I have merged two snapshots together in order to show the Paisley Lions line-up at the first ever meeting at Love Street on Saturday April 5th 1975. The riders are (l to r), Sid Sheldrick, Mick Sheldrick, Chris Roynon, Mike Fullerton, Stuart Mountford, Bryan Townsend and Tom Davie. 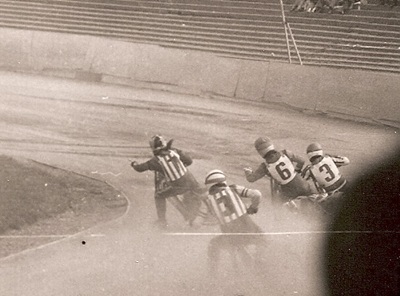 Birmingham Brummies were the opposition in a challenge match. They were a big city glamour team, had won the 1974 British League Division 2 and went on to win the 1975 New National League. The Paisley side won a close match by 41-37 and repeated the win, this time 45-33, in the last match of the season. The Lions' co-promoter Joe Thurley has suggested that if the Rootes car manufacturer, who made the Hillman Imp at the nearby Linwood complex, had come along with a million pounds, then the team would have been the Paisley Imps! 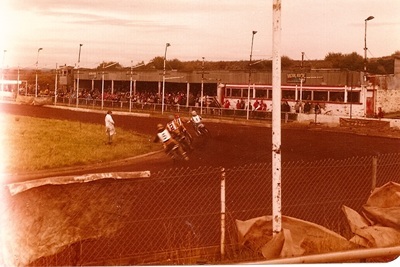 The date is Sunday 11th May 1975 and the Tigers are racing at Derwent Park in the New National League. This first bend action shot shows Heat 4 with Mitch Shirra and Paul Heller against Lou Sansom and Kym Amundson of the Workington Comets. It resulted in the third 4-2 in a row for the Comets who went on to win the match 46-32. Mitch, at the tender age of 16, scored a very creditable paid nine from six starts. Promoted from number eight into the Workington side was a certain 17-year-old Stephen Faulder Lawson, who was also paid nine from his five races. This was Steve Lawson's second match against the Tigers. "I remember my first visit to Coatbridge" (on the previous Friday), "I hated the place and scored nothing," he wrote in The Steve Lawson Story in 1988. Steve went on to average 8�00 from two matches at Coatbridge the following season! 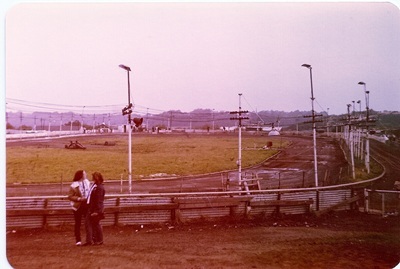 The track at Coatbridge proved to be only a temporary home for both the Monarchs and the Tigers when the football club evicted the speedway promotion half way through 1977. After just a few weeks without speedway in the West of Scotland, the Coatbridge Tigers became the Glasgow Tigers when the Blantyre Greyhound Stadium hosted the National League match between Glasgow and Crayford. This photograph of "Blantyre 1" as the greyhound stadium is sometimes fondly remembered, was taken in September 1981 prior to the match against Stoke. Due to redevelopment, this was to be the final season at the stadium and the last meeting took place on Sunday 18th October. The stadium in Blantyre was very similar to the layout at Armadale, with less covering for spectators. As a Tigers fan I was delighted with the reprieve that we had been given in 1977 and I often wonder what would have happened had this lifeline not been available. "Sadly this last ever meeting at Blantyre was affected by overnight frost which seriously lifted the track surface around the first and second turns, rendering racing difficult and with only a small attendance braving the bitter cold, the venue closed in the face of redevelopment to a less than enthralling spectacle." One unique feature of the Blantyre track was the position of the referee's box, which was not in line with the tapes but positioned a few metres further down the track. I do not recall how the Glasgow promotion got away with this anomaly. "and so do Cradley fans!, the ones that were there anyway!"